On Sept. 13, 2010, the people of Anacortes, Wash., opened their Sunday paper to read the headline, “Anacortes water, bottled?” The next evening, the City of Anacortes, Wash., approved selling five million gallons of municipal water from the Skagit River for thirty years to Tethys Enterprises of Everett, Wash. The contract can be extended to 2040 and contains two optional, five-year renewal terms. The contract allows Tethys, a startup venture capital company, to flip the proposed one million square foot beverage bottling company in three years. Anacortes citizens had neither an opportunity to review nor comment on the contract’s implications before the city council’s approval of the Tethys contract. It was approved the next day, Sept. 14, 2010. According to the Skagit Valley Herald, Mayor Dean Maxwell had met with Tethys and Anacortes city council members for five previous months, exchanging information on an individual basis, and, thus, city officials were not required to discuss the business proposal in an open, public session. An interesting note is that Mayor Ray Stephanson of Everett, Wash., turned down Steve Winters, CEO of Tethys Enterprises, regarding a similar municipal water contract after fifteen months of negotiations. Due to the appalling lack of City of Anacortes-citizen communication, I searched the Internet for local environmental groups that would band together to confront the Tethys contract decision. Unfortunately, there were none. Either local environmental groups are tied to the city with municipal grants/projects or are exhausted from battling the city over development and policy issues that affect neighborhoods and the environment. However, my persistency found people online who were willing to come to my home and hear Dr. Rebecca Wolfe of the Alliance for Democracy and the Sierra Club speak about environmental issues related to beverage and water bottling companies and the corporate control of water. She gave us support when no one else stepped up to the plate—and she has continued to guide us. From this initial group gathering, four of us are finding our grassroots way to educating the community about water as a sustainable human right. On Jan. 25, 2011, we organized “Your Water—What You Should Know” at the Anacortes Library. Eighty-six people attended, which is a good showing in this island community. Outstanding speakers shared their knowledge: Ingrid Tohver of the Climate Impacts Group of the University of Washington, Seattle; Mark Savoca of the U.S. Geological Survey, Tacoma; Jen Kingfisher of The Plastics Project, Port Townsend Marine Science Center; and Erica Pickett of the Anacortes City Council. Although Pickett said that she had no information on Tethys’ negotiating progress of land purchase, she shared Anacortes’ municipal water history in a Power Point presentation. Although we have now formed a citizens’ State Environmental Policy Act (SEPA) group of twelve people, we do not know when the SEPA process will proceed. Tethys has until Oct. 2012 to inform the City of Anacortes where it will site the beverage bottling company. The SEPA process offers only a two-week window for citizens’ written input after Tethys applies for a building permit. We realize that SEPA is favorable towards corporations, so we are now looking to the Community Environmental Legal Defense Fund (CELDF), which conducts Democracy Schools. I attended Democracy School on Feb. 18 and 19 in Seattle and must admit to being somewhat overwhelmed by the powers of corporations. However, we are in contact with Kai Huschke, CELDF’s Washington State representative in Spokane. Kai has generously offered to come to Anacortes to teach us how to assert our citizens’ rights about business sustainability. 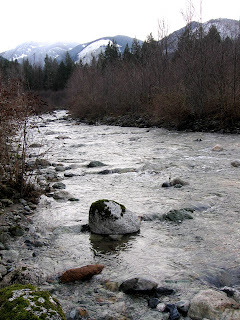 Moreover, the Skagit River belongs to all surrounding communities. The City of Anacortes contracted with a company for water-intensive uses, allowing a dangerous precedent that negates sustainability and impacts future generations of the Skagit River Basin. Today, on World Water Day, in Everett, Washington (where we defeated an attempt by Tethys Enterprises in 2010 to build a one-million-square-foot bottling plant for "water-intensive purposes), the community activists who achieved this great result will meet with more members of the area for a showing of the film, "Tapped." We are organizing to oppose a new attack in Everett from the water bottling industry -- from Bellevue-based "Evergreen Bottling Company." Their name, "Evergreen," is a typically Orwellian attempt to fool the uninformed into believing that their products are good for the environment. Bottled waters and other beverages are certainly NOT good for the earth nor for people unless in areas of the world where tap water is unavailable or unsafe to drink (as in Haiti and Japan following earthquakes there). "Tapped" stars our own Ruth Caplan who has worked with our AfD co-chair, Nancy Price, for many years on defending water as a "commons," to be protected legally and otherwise for people and nature. Sandra Spargo is doing a fine job of helping us educate people in the Skagit River Basin about the many interrelated pieces of the water crisis -- droughts in the summer and floods in winter and spring, the drastic decreases in our aquifers and private water wells. Thanks to the many dedicated people at the Alliance for Democracy, the UN Association of Greater Seattle, and in the Sierra Club for their tireless efforts on "water as a human right" and as a right for the natural world, as well. Another question to ask the bottler is their bottles are BPA free. If not, the the city must refuse to participate in an act we know will ultimately lead to damaged children. BPA is being banned on an internantional scale as a significant hazard to human health. A recent study shows that over 90% of newborn umbilical cords show BPA. Knowing this, if the city participates in spreading a known hazardous chemical it can be held liable for damages in a class action suit. This should be advertised in your local newspapers and by handouts and mailings. Governments that knowingly cooperate in damaging enterprises are as guilty as the actual actor. It's past time for America to demand accountability on such matters. Did anyone notice that the proposed consumption rate the city council agreed to is 5,000,000 gallons of water PER DAY? That's 1,825,000,000 gallons per year. I find all of this totally outrageous! Water of all things being bottled, and sold.